To contact Robin, please fill in the form below. "I'm SO Glad I Came To This Event!" "Coming to this event has had a huge, positive impact on me. Even though I have had the Toolkit for three years, these two days have refreshed and reinvigorated me with more clarity on how to go back and actually IMPLEMENT the campaigns, ideas and strategies I've been procrastinating on. Watching the dynamic presentations, hearing her team go over everything in more detail and just being here has definitely changed my life and business for the better. I strongly recommend to anyone – newbie or a long-term client like me – to register and attend." "Thank you for such an awesome event! Your team's willingness to share their knowledge and answer our questions was fantastic, and I definitely saw a lot of value from attending. You're the best!" – Sid Rothenberg, Reliable Information Technology, Inc.
"Get Off The Fence And Register! Robin Will Not Disappoint!" "I listen to the webinars and watch the videos Robin does, but pulling together a fully packed agenda that held interest was a totally different story. Robin's team DID NOT disappoint! The approach is fresh and adds a lot of new concepts. ANYONE who is contemplating any of these events and is perhaps unsure of the cost versus reward…GET OFF THE FENCE and register! You WILL NOT regret the decision!" 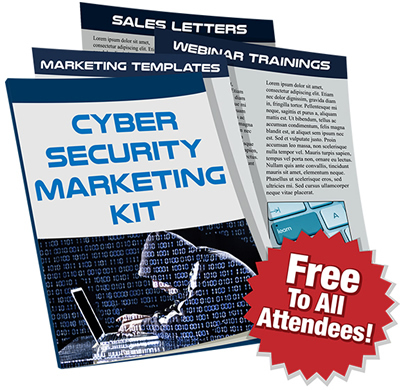 – Cindy Kelly, NetProtect, Inc.
"I Had 20 Raving Responses That Blew Me Away!" "After I came home from last year's event I sent out a 'testimonial request e-mail.' I sent 106 e-mails to customers from the last five years. Three days later, I received 20 raving responses that have blown me away. I had a feeling we were good at what we do, but this confirmed it in an incredibly impactful way. I look forward to using these great testimonials with our newsletters, websites, and employee motivation! A shout-out to Robin and her team for putting this together – and for the motivation to do something new and kind of scary."